The upper cab may have been fitted as part of a snow plough or blower installation. Well that is a standard open cab long wheelbase with Banjo axles and no winch, which is about all you'd be able to discover. Some of the chassis numbers identified if it was originally a tipper, or a chassis cab, or whatever, but not mush more. Indeed, but if you look at a proper closed cab GMC everything is rounded and sloped, cab, roof, screen, rear. 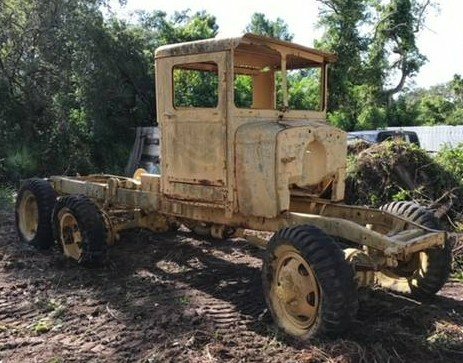 It's not a wartime production cab, no, and probably not from a GMC factory, but it looks like it was made for that specific job. Somewhere in the US a small factory would have turned out modest quantities of these cabs, probably as quick assembly kits, just because there were so many open cab trucks that really wanted a roof. May be military, or may not. ... virtually identical except they kept the rounded lower door shape. Reference cab ID, I can't help thinking this looks very Australian to me, the cab is very International /ACCO in appearance. GMCs were fitted with two types of axle, Either a Timkin split axle or a Chevrolet banjo type. Overall width of the axles and road spring mounts would be the same dimentions. 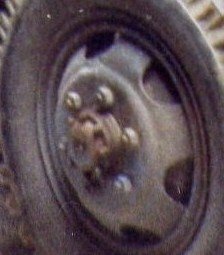 Rear split and banjo axles had the same brake cylinders and brake shoes, fronts had different wheel cylinders and brake shoes. Drive line viewed from above on a split axle vehicle is paralell with the chassis rails on a banjo vehicle the propshafts are off line. Engineering of the steering driveshaft constant velocity joint for split and banjo due to the position of the differential units will probably account for the different hub style. 6X4 and 6x6 GMC vehicles with the same chassis layout were supplied to the US army and lease lend contracts I think. Front wheels and tyres usually track the centre of the twin rears. In the interests of commonality the same wheel dishes were used all round. I have enclosed pictures of a 352/353/DUKW banjo rear axle. DUKW axles have different oil reals to keep the water out of the diff. Every day is a day at school, Questions are good, keeps the gray matter working Basicaly there is a centre beam section either split type or banjo, or in some cases bath tub with a differential that has steering /constant velocity joint housing, hub carrier bolted to each end. Then at the rear a track rod tying both housings together for the vehicle steering. These are basic drive axles with leaf springs suspension, not independant suspension design or walking beam. Axle torque is managed either by the design of the leaf springs or by the use of torque rods, mostly on the rear axles. Sorry I do not have a front drive axle to photograph. The 6x4 has a forged steel beam axle which is straight with upturns outboard of the road springs. Check the following link, I know it is related to a model but the inset photo shows the real thing as well. Nothing out of the ordinary much like and other non driven axle on the front of a lorry. I forgot all about the dumb axle of the 6x4. I think the 6x4 had a higher gross weight than the 6x6 because it was not expected to do long distances or be used as much off road. In peace time it was the sought after truck for the burgeoning road transport industry. IIRC the 6x6 was nominally rated at a 2.5 ton payload for off road, 5 tons on road while the 6x4 CCW was rated at 5 tons as it was not expected to be used off road.